Owning a boat in Port Richey, Florida, can provide endless hours of relaxation and adventure. However, any watercraft owner can tell you that boating comes with some tedious tasks as well. For example, if you store your boat in the water, frequent maintenance is required to combat corrosion, organism growth, and other sources of damage to the hull. 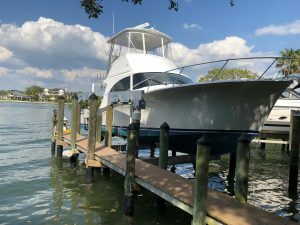 However, if you store your boat above the waterline with a boat hoist, you’ll get to spend much more time enjoying your vessel without having to worry about constant upkeep. At DECO Boat Lifts, we offer a variety of lift systems to suit any size and type of vessel. For those looking for an entry-level boat lift capable of hoisting vessels of up to 16,000 lbs., our Maxi Lift is the ideal choice, as it provides reliable lift performance thanks to its heavy-duty aluminum flat plate drive system. Or, you can opt for our signature DECO Lift that comes standard with a box beam construction to prevent twisting under heavy loads over the long term. This option also features our proprietary sealed gearbox design, delivering fast, quiet, and trouble-free performance. Additionally, we’re proud to offer the industry’s most advanced boat hoist – the Concept CRS Lift. With a direct drive system, this lift is exceptionally powerful and is free of belts, pulleys, and chains to reduce maintenance. Plus, it comes equipped with our patented Cable Retention System (CRS), which puts an end to destructive cable overlapping. Contact DECO Boat Lifts today to learn more about the boat hoist systems that we offer in Port Richey, FL. When you do, you can also ask about the numerous lift configurations we offer to suit your property, including a beamless lift that is free of overhead beams and an elevator lift that can be mounted directly to the seawall.